As if being named Time‘s Person of the Year weren’t enough, a leading LGBT magazine has now bestowed Pope Francis with the same honor. The Advocate announced Pope Francis as the “single most influential person for 2013 on the lives of LGBT people” in a year when several highly influential persons, including Edie Windsor and others who battled in US courts to end the Defense of Marriage Act, were also considered. “The most influential person of 2013 doesn’t come from our ongoing legal conflict but instead from our spiritual one — successes from which are harder to define. There has not been any vote cast or ruling issued, and still a significant and unprecedented shift took place this year in how LGBT people are considered by one of the world’s largest faith communities. The Advocate thoroughly details the positive words and actions of Pope Francis in less than a year which signal a welcome and openness to love LGBT people. They recall his interview with America where he condemned the bishops’ obsession with anti-equality campaigns and said God sees gay people with love. They recall the impact he has had on bishops, like Cardinal Oswald Gracias of India who recently spoke out against a law criminalizing homosexuality in his nation and demanded priests pastorally speak about LGBT people. They recall the pope’s letter to an Italian gay group, Kairos of Florence, which was respectful and opened a dialogue. We agree with The Advocate about the importance of Pope Francis’ positive affect on the Catholic conversation about LGBT issues. We also agree with the magazine’s point that the key to more permanent change will be if the rest of the Church follows his example of acceptance and love. Change in the church will come not directly from the pope, but from how the rest of the Church–laity and hierarchy–will follow suit. While Catholic laity in the U.S. and many other countries already support LGBT equality, we must remember that in many other nations, this is not necessarily the case. The recent example of Croatia’s referendum against marriage equality is instructive here. As we’ve noted before, the pope’s influence is not in making policy changes, but in setting the tone and establishing processes that will allow true change to percolate up from below. Pope Francis, with his many positive statements and especially his call for consultation from the laity on matters of marriage and family, is already exerting this type of influence profoundly. 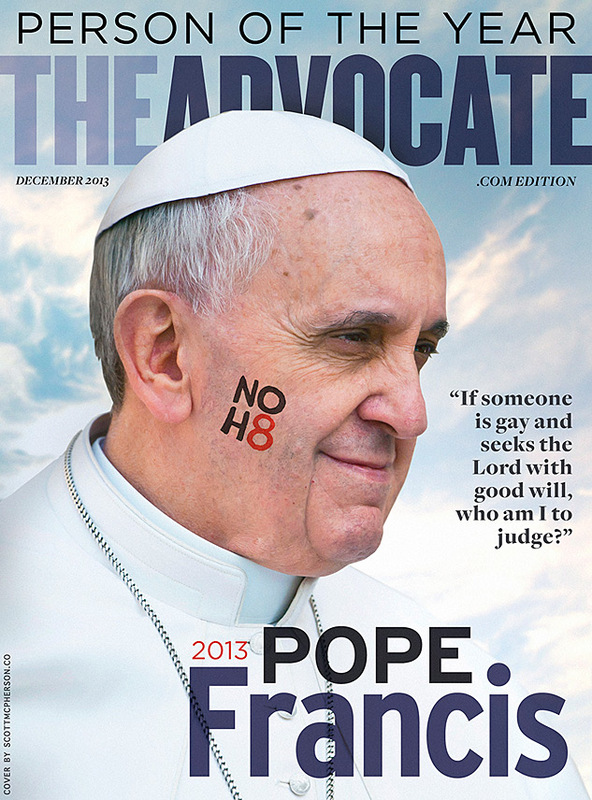 Pope Francis has made 2013 a year of unexpected excitement for LGBT issues. He is the first pope to publicly use the word “gay.” He has corrected church leaders’ “obsession” with same-gender marriage. He has reached out to lesbian and gay Catholics in unprecedented ways. In this year of so many “firsts” surrounding the pontiff, the fact that a pope has been named “Person of the Year” by an LGBT publication–something truly unimaginable for far too long–is definitely one of the most remarkable developments. I am so pleased that the Advocate (and Time) chose Pope Francis as person of the year. I have seen how his tone and his approach have reached everyday Catholics. During the recent effort to pass equal marriage in the state of Illinois I was amazed at how many Catholics cited their Catholic faith as a main reason for supporting the bill and I sat in awe listening to pro-marriage legislators invoke the name of our Holy Father. (I was also amused watching the Illinois bishops’ lobbyists fidget and gag at every mention of the pope.) It is a new day. We can only pray that the tone of this papacy filters down to our bishops.